The chicken from hell and other bizarre critters! 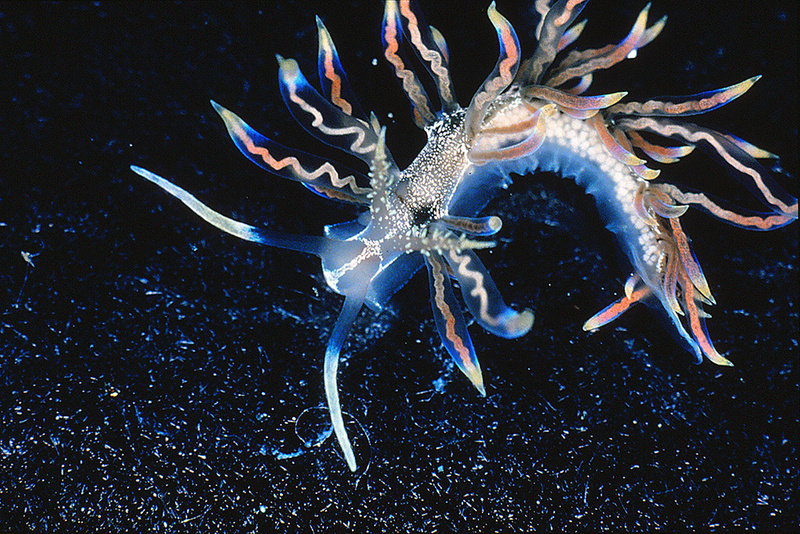 The inch-long sea slug Phyllodesmium acanthorhinum is a "missing link" between sea slugs that feed on hydroids (small predators related to jellyfish) and on corals. This beauty lives in Japanese waters. About 18,000 species are named every year — adding to nearly 2 million that have already gotten a name. On May 21, the International Institute of Species Exploration at the SUNY College of Environmental Science and Forestry released its latest list of top-10 new species. As the institute said via press release, the goal is to highlight the fascinating discoveries being made even while species go extinct faster than they can be identified. “The last vast unexplored frontier on Earth is the biosphere,” said Quentin Wheeler, president of the College of Environmental Science and Forestry. "We have only begun to explore the astonishing origin, history, and diversity of life." Undiscovered species contain undiscovered wealth of all descriptions, Wheeler added. "Among the remaining 10 million are irreplaceable clues to our own origins, a detailed blueprint of how the biosphere self-organized, and precious clues to better, more efficient, and more sustainable ways to meet human needs while conserving wild living things." Images and some text courtesy of International Institute of Species Exploration, State University of New York College of Environmental Science and Forestry. Dendrogramma enigmatica: Mushroomy mystery emerges from museum drawer! In 1986, a 1,000-meter deep ocean trawl near Australia yielded 18 disks attached to short stalks -- and more questions than answers1. 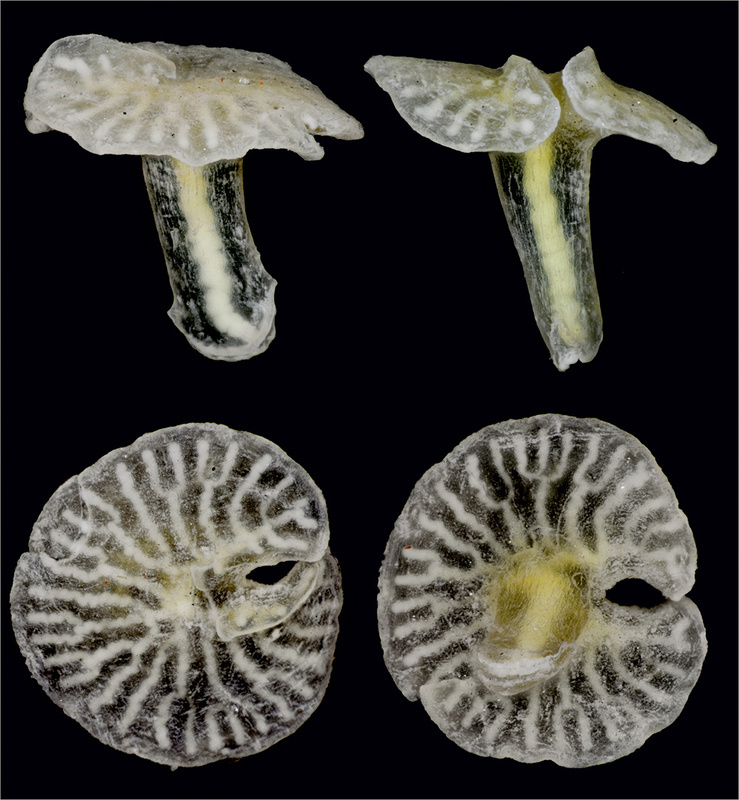 Dendrogramma enigmatica (savor that name!) and the close relative D. discoids are 11 millimeters across whatchamacallits. They have a mouth on the disk, but there are signs of neither propulsion nor attachment to the ocean floor. The new genus resembles phylum Cnidaria (jellyfish, corals, sea anemones and hydras) and phylum Ctenophora (comb jellies) but there's nothing definitive -- the DNA did not survive storage in formaldehyde and alcohol. The head of the scientific squad wrestling with these oddities, Jørgen Olesen of the University of Copenhagen, has been hesitant to create a new phylum for them, but suggests they represent "an early branch on the tree of life, with similarities to the 600 million-year-old extinct Ediacara fauna." 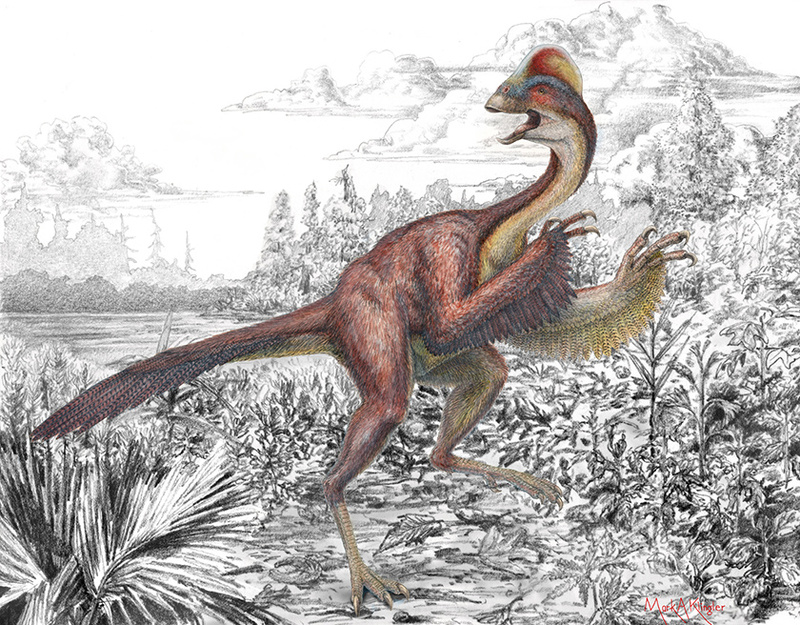 Anzu wyliei: Fashion-forward dino – or the "chicken from hell"? With hollow bones, a parrot-like beak, and of course those high-style feathers, the crested dinosaur Anzu wyliei was part of the "bird look" that became so popular with the high-flying set. Three specimens were discovered in the Hell Creek Formation in South and North Dakota, United States, in 19982. About 3.5 meters long and weighing 200 to 300 kilograms, the "chicken from hell" ate plants, small animals, even eggs over easy. A contemporary of T. rex, Anzu wyliei made nests and guarded its eggs as they hatched -- or so paleontologists believe. Aside from those stunner looks, the "chicken" is valued for its relatively complete specimens, which helped untangle the ancestry of its relatives. The discovery of a new species of pufferfish, Torquigener albomaculosus3 solves a two-decade marine mystery. Male fish make these precise, 2-meter-diameter spawning nests by swimming and wriggling in the seafloor. The ornate circles begin as girl-getters rather like the nest of the bowerbird, but the ridges and grooves also reduce currents at the center to protect the eggs from turbulence. Underwater photographer Yoji Okata first observed this artistic aquatic architecture. Deuteragenia ossarium: Wasp mounts chem-war defense! Protection also matters if you're a wasp casting your genetic future to the winds -- in other words, depositing your eggs. The daintily named bone-house wasp, a half-inch-long top-10 standout, has an unusual tactic: pack the brooder house with chemical repellent so predators will turn up their noses at your matrimony. The Deuteragenia ossarium wasp builds multi-cell nests in hollow stems and deposits one spider in each cell to nourish her young as they develop. She seals each cell with a soil wall, kills a spider for the next cell, then fills the last cell with up to 13 dead ants. The wasp is the first animal known to create such a chemical barrier to a nest, and it works: Deuteragenia ossarium, found in Gutianshan National Nature Reserve in eastern China, has significantly lower parasitism rates than similar cavity-nesting wasps4. Cebrennus rechenbergi: Rollin' and tumblin'! A newly-named acrobatic arachnid5 living among Moroccan sand dunes has found a new use for its eight long legs: why run from danger when you can cartwheel? In the face of a threat, the gymnastic Cebrennus rechenbergi lurches up, then throws its body over into a cartwheel, doubling its speed. Tough terrain? 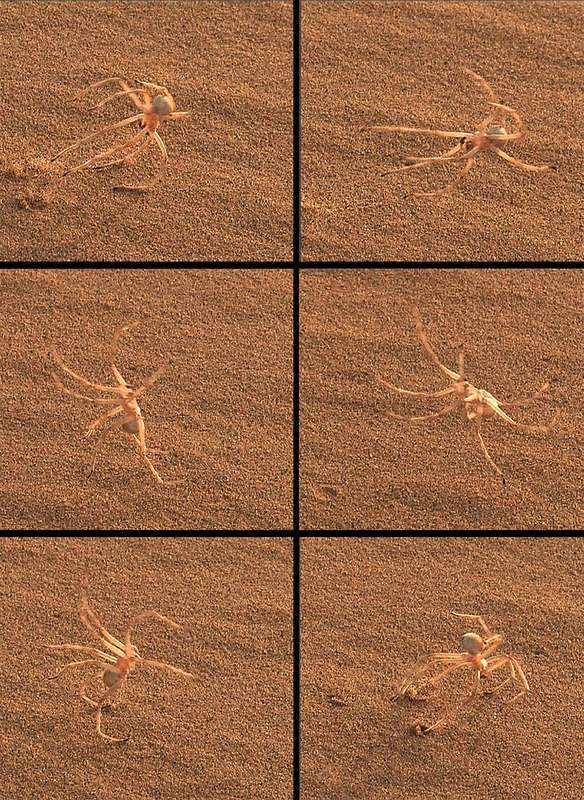 No problem: While other spinning spiders only roll downhill, C. rechenbergi can maneuver up, down and around the desert dunes. Here's the most outlandish aspect of this defensive move: the spider propels itself towards the threat, not away. With few places to hide among the barren dunes, C. rechenbergi embodies the mantra that the best defense is a good offense. The spider's discoverer, Ingo Rechenberg, is a bionics expert fascinated by the ingenious mobility of desert species. Rechenberg has since designed robots that mimic the spider’s motion, which could be useful for exploring Mars. Mexico’s Christmas season is a parade of elaborate decorations, focused, both culturally and visually, on the nativity scene, or “nacimiento.” Intricate altars depicting the birth of the Child Jesus are often adorned with native Spanish moss and beautiful epiphytes (rootless plants) known as bromeliads. One bromeliad long appreciated in the Central highlands, and a frequent component of altar displays has, until now, escaped the scientific compulsion to name species. Tillandsia religiosa6 (got to love that name!) inhabits rocky outcrops in deciduous, coniferous and cloud forests within a narrow band of elevation from 1,800 to 2,100 meters in Morelos State. T. religiosa, with its hard-to-miss rosy-red flowers, is a humbling reminder that discovery may lurk beneath our noses. In a testament to stupendous camouflage, an insect in the giant stick family has only now been noticed7 by entomologists in Vietnam. While Phryganistria tamdaoensis may not be the world’s longest stick (that title belongs to Phobaeticus chani), it is 9 inches long! So how DID such leggy characters elude the eyes of science for so long? It's not just that uncanny, stick-similitude: Giant sticks are slow-moving and drop motionless to the ground when disturbed; a better stick impression there is not. Science’s slowness to find these giant insects is compelling evidence that more remain to be discovered. Keep your eyes on the sticks! Australian "dragon." If it's hot, eggs hatch with female genitalia but male genetics. First animal ancestor discovered in deep mud! Ancient filter-feeder was a "gentle giant"